The University’s degree day celebrations took place last week with 17 Degree Congregations held over five days in the Great Hall. A total of 4464 students graduated, including those from Edge Hill College and St Martin’s College. HRH Princess Alexandra presided at the afternoon ceremonies on Monday, Tuesday, Wednesday and Thursday. 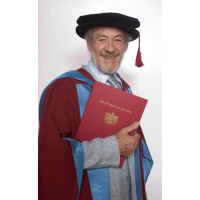 Honorary Degrees were been awarded to Dr Ahdaf Soueif, Sir Ian McKellen, Dr David Starkey and to Professor Tim Berners -Lee. While working at CERN he invented a hypertext programme that created the possibility of the World Wide Web. This allowed the Internet to be used for communicating and sharing information of all kinds with such ease that the web has become a fundamental part of human life across the world, accelerating the emergence of a world economy based on knowledge. He surrendered any claim to direct personal benefit from the World Wide Web, but remains actively engaged in its future development. Ian McKellen, is among the most distinguished British actors of his generation and was brought up in Lancashire. In a glittering stage career he has won many awards for the reinterpretation of classic roles and the creation of new figures in contemporary drama. He has extended his audience through the cinema, playing such a notably complex and subtle role as James Whale in Gods and Monsters, and vividly reconfiguring Richard III in an imaginary Fascist Britain. Through his commanding iconic roles in X-Men and especially as Gandalf in the Lord of the Rings trilogy, he has received the admiration and affection of young people across the world, who have experienced the power of a deeply considered dramatic technique. Ahdaf Soueif, an Egyptian national and a PhD graduate of Lancaster University, is a writer of considerable distinction. Her collection of short stories, Aisha (1983) was shortlisted for the Guardian Fiction Prize and her novel The Map of Love (1999) was shortlisted for the Booker Prize for Fiction. Her Sandpiper collection (1996) won the Cairo International Book Fair Short Story Award. In 2003 she chaired the Orange Prize for Fiction panel. Ahdaf Soueif’s fiction (which explores connections between Egyptian and British life) and her newspaper and magazine articles are helping us to understand Arab perspectives on current international issues. David Starkey is one of the most distinctive and engaging interpreters of its history to the British nation. After a Kendal childhood he was trained as a professional historian in the combative environment of Tudor studies at Cambridge University. This enabled him to develop an impressive familiarity with the scholarship, the archives and the artefacts of that period. He has used this to create television programmes that have sparkled with authority, fresh information and wit. An authority on the Tudor Court, he has become a leading commentator on the British monarchy.